I have no idea what that phrase means but I heard some of the celebrities say it on Dancing With the Stars a couple of seasons ago. I'm a sucker for catch phrases (and the game Catch Phrase), especially rhyming catch phrases. Throw some alliteration in too and we are golden. But I never really liked KFC, or any other questionable chicken in a greasy bucket type place. And for some reason, winner winner chicken dinner makes me think of a bucket of chicken. Maybe they put a bow on the bucket? With the help of my trusty sidekick, Annelise, who drew the name out of a bowl a few minutes ago, I am happy to announce the winner of my little giveaway. 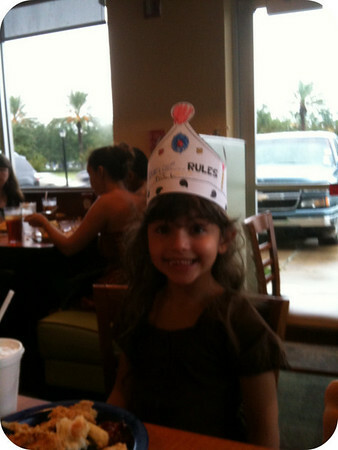 Who: Annelise with crayon colored crown. What: Lunch today at Luby's after church. Hope every one had a wonderful weekend! Woohoo!! I'm glad you had a link with my name otherwise I would have thought it was a different Jill! I've heard "winner, winner chicken dinner before" and think it's hilarious, though I have no idea what it means or where it came from. I've never been to a Starbucks before, except for the Barnes and Noble cafes to get hot chocolate and cookie. I'm good with whatever, I'm just excited to win! Thanks! Kim: Yeah, that pork chop was something. :) We went the little less highfalutin' route with LuAnn plates. I think we are totally highfalutin'(i always wondered how you spelled that..haha). Anyway, it was a fun time. Kim gets the prize for the best lunch. haha! And why did I not see you take that picture? I was sitting right next to you? LOL! Cute blog and haircut! Peace!